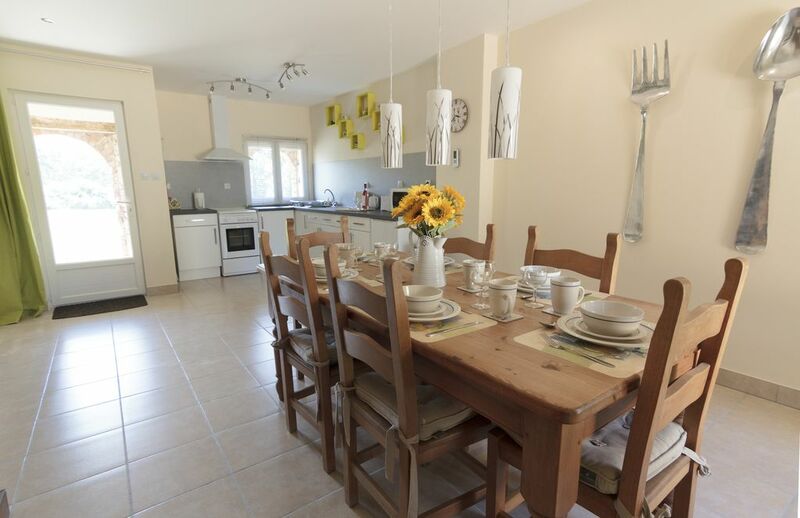 Couples Retreat ideal for 1 or 2 couples to share - Meadow View Gite - This is a fully self-contained 2 bedroom holiday cottage with one double bedroom and one twin bedroom complete with access to free WiFi throughout. The lounge has ample comfortable seating on 2 settees, an LCD TV with DVD and satellite for free view UK channels, and also a wood burning stove for those winter evenings. The Dining room section has a large antique pine dining table with ample room to seat 6 people in comfort with a matching antique pine dresser to match. The well equipped kitchen has all the items that you may need to prepare your meals and ensure a relaxing holiday. The Twin bedroom also light and airy with a neutral decor scheme has two pine single beds, a large chest of drawers with mirror over, with pretty views out over the garden courtyard. Outside there is an enclosed private garden with views over the meadow and on to the surrounding fields and mighty oaks that dot the landscape as well as a private patio area with table and seating for 4, a very pleasant place to sit with a glass of wine or have a relaxing barbecue and watch the sunset with views down towards our 1 acre fishing lake. Our names are Richard and Carol Wisdom, I am now 50 years young and Carol will have to tell you herself as I dare not risk it! We have been happily married now since 24th May 1986 “CRIKEY!” that’s 31 years this year! And I don’t regret a single moment. We have two huge dogs Max the German Shepherd and Ted the Leonberger cross who both weigh about 50Kgs each but are really big softies although Max will yack on and on a bit. We live in a beautiful property called La Vergne, the house was built in 1906 and sits in 15 acres of land with an acre lake, we have only one neighbour and they keep to themselves, so it is a peaceful heaven. We moved here with Carol’s Mother Beatrice, who is on crutches and therefore somewhat dependent upon us, we have built her an annex connected to the house which is basically a one bedroom bungalow. I do possess a warped sense of humour, so be warned! We have no children, although Carol does say I am like a big kid sometimes! We enjoy an idyllic life here in France, “We really are living the dream”.You must take us as you find us, we have no heirs and graces (wouldn’t know where to find them anyway) A spade is a spade (unless its a shovel) I tinker, make stuff, break stuff, build things, destroy things and generally act like a big kid. Carol makes things, bakes lovely grub(as you can see from my minor weight problem), puts up with me, tends to our flock, grows all the veggies and flowers, continues to put up with me!, keeps house, and so much more....... Although not quite a spur of the moment decision it was certainly a huge change when we decided to up sticks and move to France lock, stock and barrel. A washing machine is available at a small extra charge per week. Upon arrival we found everything we could wish for. A welcome hamper was nice and included essentials and luxuries to help us settle in. Carol & Richard are both lovely and we felt immediately at ease, enough so that we joined in some local evening entertainment and other days and evenings together fishing and chatting. The Gite had absolutely everything you could wish for. The location is very rural and peaceful with lots of wildlife. The games room helped us to keep occupied when swimming in the lovely warm pool had turned us into prunes. Each Gite has a private garden area. But, of course, sitting by the pool after a dip is easier on the shared patio. We would have no hesitation in staying again. With such beautiful surroundings and welcoming hosts, how could we not ? A beautiful and well equipped gite with lots of land to explore. Very quiet down a lane with just a couple of farms at the end. The weather was great and the pool very refreshing although it sometimes took a while for the solar heating to really take effect.